America struggles when those who work hard can’t prosper. That’s why labor unions and worker protections are crucial to the American Dream, and therefore, the Democratic Party. At a time when Republicans shamelessly side with CEOs and stockholders over middle-class families, it’s more important than ever that Democrats and workers stick together. Here’s how we’re doing that in the age of Trump and JANUS. Unions are under attack, and Democrats are fighting back at the statehouse, the ballot box, and the picket line. 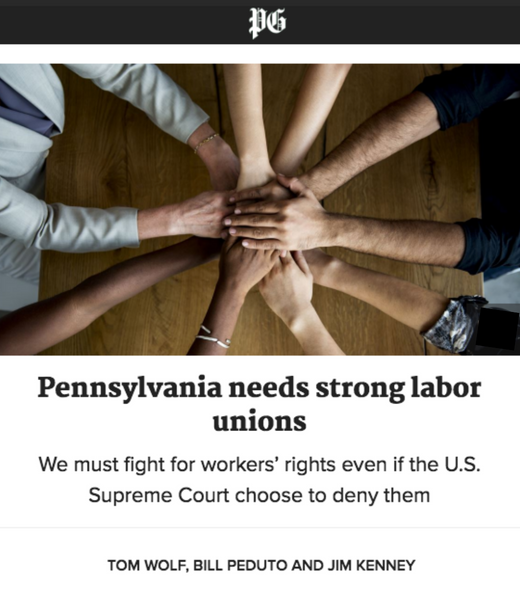 For instance, when state Republicans introduced a dangerous “Paycheck Protection” bill, Democrats organized alongside labor unions and eventually defeated the bill in the PA House–with every single Democrat voting against it. Then, we vehemently defended unions in JANUS vs. AFSCME, and now Democratic lawmakers will look to minimize the damage that decision can cause to organized labor. And unions have gone above and beyond to elect Democrats time and time again! Most recently, organized labor played a leading role in the victory by Conor Lamb in Southwestern PA, showing how workers and Dems working together can win even the toughest of battles. Lt. Governor candidate John Fetterman joined United Steelworkers as they organized in response to an expiring contract. August 30, 2018. Pennsylvania Democrats believe in raising the minimum wage, and our leaders have already acted to raise it as high as $15. This summer, Governor Wolf took action to increase state employees’ minimum wage to $12/hour immediately and $15/hour by 2024. In the legislature, Democratic lawmakers have introduced bills, currently blocked by Republicans, that would do the same for the private sector. Governor Wolf’s also leading the charge to implement various worker protections that boost take-home pay, such as fairer overtime rules. Nobody does more to create jobs in Pennsylvania than the tandem of Governor Tom Wolf and Senator Bob Casey. Senator Casey has worked across the aisle to create thousands of PA jobs, including securing $369 Million to repair our bridges and $271 Million for the Port of Philadelphia. And under Governor Wolf, 1,300 roads, 600 bridges, and 6,000+ miles of roadway have been revitalized–funding jobs all over the state. The Governor also created 15,000 new jobs through investments in a Western PA shell cracker plant, the Port of Philadelphia, and a steel plant in Johnstown. Gov. 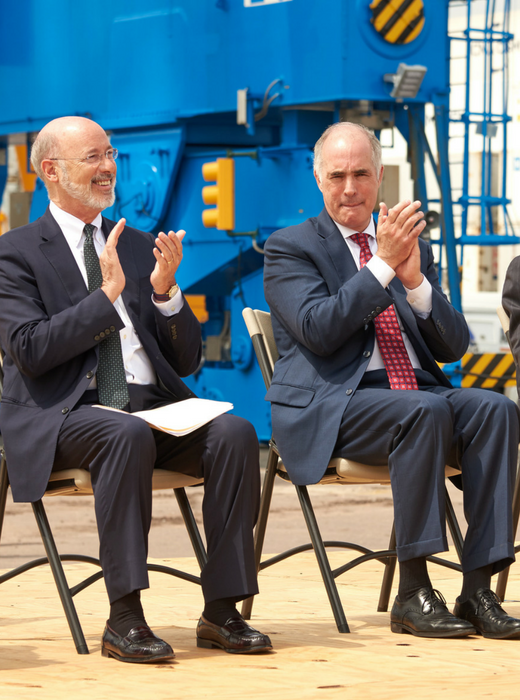 Wolf and Sen. Casey celebrate improvements to the Port of Philadelphia. Governor Wolf created the PASmart Initiative to increase access to job training and technical education for all Pennsylvanians. To date, that initiative has invested $7 Million in apprenticeship programs and $20 Million in STEM and technology training. Thanks to PASmart, the number of registered apprentices in Pennsylvania has jumped 20% since 2016, and Governor Wolf plans to double that number by 2025. On average, Pennsylvania women make 78 cents for every $1.00 a man makes doing the same job. Senator Casey’s fighting to close the pay gap by co-sponsoring the Paycheck Fairness Act. He also helped pass Lily Ledbetter, a landmark law substantially increasing equal pay protections. In Harrisburg, Governor Wolf took action to ensure equal pay for thousands of state workers. A bill expanding similar protections to all Pennsylvanians has been introduced by legislative Democrats, but it’s currently being blocked by Harrisburg Republicans. Governor Wolf stood alongside women activists and legislative leaders as he took action to close the gender pay gap. June 6, 2018. Workers win when Democrats fight on their behalf, and Democrats win when workers make their voices heard. In an increasingly difficult environment for middle-class workers, it’s crucial that Democrats, labor unions, and individual workers stand together to create an equitable economy for everyone. Donate here to help elect Democratic leaders who will fight for Pennsylvabnia’s workers.